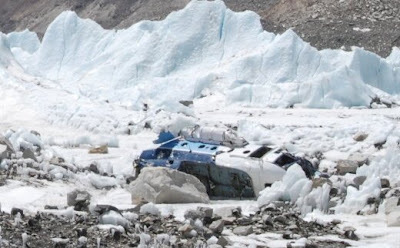 Two people were killed and several others injured when a helicopter crashed while trying to land at Everest Base Camp in Nepal. The accident happened a day before golden jubilee celebrations in the area to mark the first successful ascent of the world's highest mountain. The privately owned helicopter with nine people on board was due to take a team of climbers back to the Nepalese capital, Kathmandu. Television pictures showed the helicopter flying low over base camp before it disappeared over a ridge and crashed into a glacier in a thick cloud of smoke. Aviation officials said the two people who died were Nepalese. The seriously injured have been airlifted to hospital. Witnesses said the aircraft's wheels caught the edge of a stone shelter as it came in to land. The BBC's Jane Hughes says flying into Everest Base Camp is inherently dangerous because the air is so thin and there is only just enough lift for the helicopter blades. She adds that the accident underlines the great risks taken, particularly by local people, to support mountaineering around Everest. Several fatal accidents have occurred in the area since the jubilee celebrations got under way to mark the conquest of Everest in 1953 by Sir Edmund Hillary and Sherpa Tenzing Norgay.Earlier on Wednesday, the body of an Indian climber was carried down the mountain. 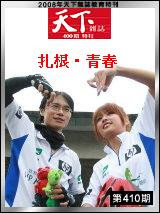 He died after falling down a crevasse. 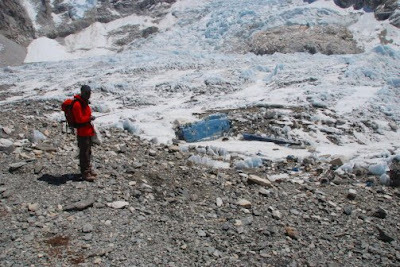 The helicopter had reportedly gone to base camp to fetch Lakpa Gelu Sherpa who this week established a speed climbing record by climbing the mountain in 10 hours and 46 minutes, according to Nepalnews.com. A record number of climbers have been assembling on Everest to ascend the tallest peak on the golden jubilee year - and a large party of international media has been there to cover the event. School children greeted those who planted trees in memory of Everest's victims On the eve of the anniversary, Edmund Hillary voiced his concerns for the future of Everest and urged the Nepalese authorities to stop issuing climbing licences for a few years, to give the mountain a rest. He was also scathing of modern-day climbers. "Just sitting around base camp knocking back cans of beer I don't particularly regard as mountaineering," he told a press conference in Kathmandu. Up to 500 of the more than 1,300 climbers who have reached Everest's summit over the last 50 years are expected to attend the celebrations on Thursday. On Wednesday, around 200 of them gathered on a picturesque hillside to plant trees in memory of those who have died on Everest. Jamling Norgay Sherpa, the son of Tenzing Norgay, joined the many families and friends at the service in Memorial Park at Kakani, around 40 kilometres (25 miles) north of Kathmandu. The event also marks the start of attempts to re-green Nepal, which has lost many of its forests particularly in the Everest region. "It's good to see the summiteers planting trees - it's a good way to preserve the environment," said Jamling Norgay, who followed in his father's footsteps to the summit in 1996.